In the ever-expanding smartphone war, the only two mobile phone manufacturers making any notable profits at present are Apple (with iOS) and Samsung (with Android). Despite Android togather with Samsung dominating the global market share, players such as LG, HTC, Pantech, and Sony are scrapping for market share as well. 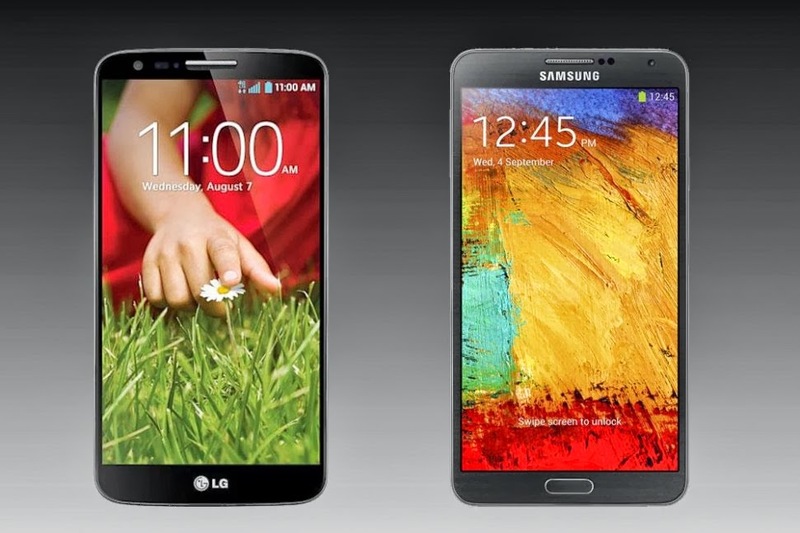 The LG G2 is the follow-up to LG's Optimus G Pro. It is one of the few smartphones on the market powered by Qualcomm's Snapdragon 800 quad-core SoC. The G2 sports a 5.2-inch 1080p display, 2GB of RAM and up to 32GB of on board storage. However, the 2.26GHz quad-core Snapdragon 800 chip on board also has Qualcomm's Adreno 330 GPU that even gives NVIDIA's Tegra 4 a run for its money in gaming and graphics performance. Though the G2 has a rather unorthodox volume rocker and power button assembly on the back of the phone, once you get used to the location, it's actually a pretty comfortable system. What's pretty impressive though is the G2's performance combined with its 3000mAh battery that offers a solid balance of horsepower and battery life and rivals flagship phones like the Samsung Galaxy S4 and Apple's iPhone 5S. Nokia Lumia 900 is a Scrumptious Treat! Any Nokia spy who has been sniffing around to get a foretaste of Nokia Lumia 900 would’ve had their plate full with all kinds of rumors. And now with the phone launched,and the rumor mills halted, we finally get to sink our teeth into the scrumptious device. A little heads-up: The first bite is lip smacking! With a 4.3-inch display Lumia 900 is the largest smart phone ever conjured up by Nokia, often touted as Windows Phone’s flagship model. While the size has been upped, the design is clearly an evolution of Nokia Lumia 800, which in turn was an offshoot of Nokia N9 Meego. So if you ever get your hands on one of these babies, what you’ll have is a device much bigger in size than ever before with features that haven’t really been explored in the past. Lumia 900’s massive screen is AMOLED and has a resolution of 800 x 480 pixels – which again is quite decent indeed. The text and icons on your phone will look sharper but it wouldn’t be excessively sharp on the display. Nokia ClearBack Display allows the screen brightness to modify itself in synchrony with the surrounding light making it more than viable to be used in any condition. The display is extremely bright and makes browsing or texting a dazzling experience. Nokia Lumia 900 is available in three – black, cyan and white – colors, which adds to its aesthetic allure and diversity. And despite its monstrous size Nokia’s latest device is actually pleasing to the hand owing to its weight and shape. The cell phone weighs 160g – again decent, for its class and size – and measures 127.8 x 68.5 x 11.5 mm. In fact, its width is actually less than Lumia 800, hence adding to its user-friendliness and overall comfort. There are a few variations from the Lumia 800, especially at the top of the Lumia 900. There is no plastic cover for the USB port, and change of access route for the microSIM port. There is also a slight change in the side function buttons; even so, their accessibility is as smooth as that of its predecessor. Owing to the adjustment of the screen, there is an obvious layout reshuffle; most notably in the touch-sensitive navigation buttons. Plus a front-facing camera has been added to the design to facilitate video calling. And there is another 8-megapixel camera on the rear side which has dual-flash and also Carl Zeiss optics. The camera has the potential of conjuring up 3264 x 2448 pixel images, and has a 3x digital zoom to further add to the array of mouthwatering prospects. The main menu is where Lumia 900 has sprung the biggest surprise: the user can now switch the front and rear cameras by a button’s tap! Not to forget the front camera giving 1280 x 720 pixel images via a 1-megapixel CCD. Lumia 900 is the first handset to have Windows Phone Tango update. It might be bringing as many updates as Mango, but it still does speak volumes about the direction of the platform. And while Tango’s most significant new feature might be irrelevant to the Lumia 900, video attachment support in texts among other background tasks definitely add to the cell phone’s flavor. Despite the bigger screen, Nokia Lumia 900 is incredibly user-friendly and sleek. The brightness of the screen is another highlight in this amazing device, which has been aptly coupled with a robust battery – much to the intrigue of a multitude of Nokia spies and cell phone scouts. If what you want is a Windows phone (one that accompanies a large screen) then look no further. Jane Andrew writes about Nokia spy software and <a href="http://www.mobistealth.com/keylogger">keylogger</a> technology. She provides tips and news about cell phone and Nokia phone security. You can also follow her on Twitter @janeandrew01 to get the latest tips about nokia phone security and privacy. Discover what makes XOLO X900 with Intel Inside® the benchmark on speed and performance. Please head to the site directly by hitting the title. Intel dominates the business of PC processors. But as consumers shift increasingly to tablets and smartphones, the company is trying to quickly move to serve those devices. On a visit to Bangalore last week, Justin Rattner, CTO of Intel, talked exclusively to TOI on a range of issues, from the nature of work its Bangalore labs are being asked to do, to some really futuristic, almost sci-fi, stuff. More at this link from Times of India! Broadcom recently announced a single-chip HSUPA baseband processor that integrates key 3G mobile technologies and will improve smartphone performance and features. It also added that the processor is the first to combine high-speed upstream package applications with 3G connectivity and built-in graphics processing. Built with an integrated ARM11 core and capable of running Google's Android and Microsoft Windows Mobile, the BCM21553 baseband chip could pave the way for cheaper but much more sophisticated handsets. Other features include 5.8Mbps upstream and 7.2Mbps downstream bandwidth.